My stone relief sculpture combines techniques of opus sectile mosaic with relief. In essence I am piecing together stone slabs the way a quilter pieces together fabric. I enjoyed building stained glass panels for several years until I discovered a saw that could cut stone slices into curves. Purchasing my first diamond band saw put me in rock heaven where I still live today! I begin by drawing my designs on paper with certain materials in mind. 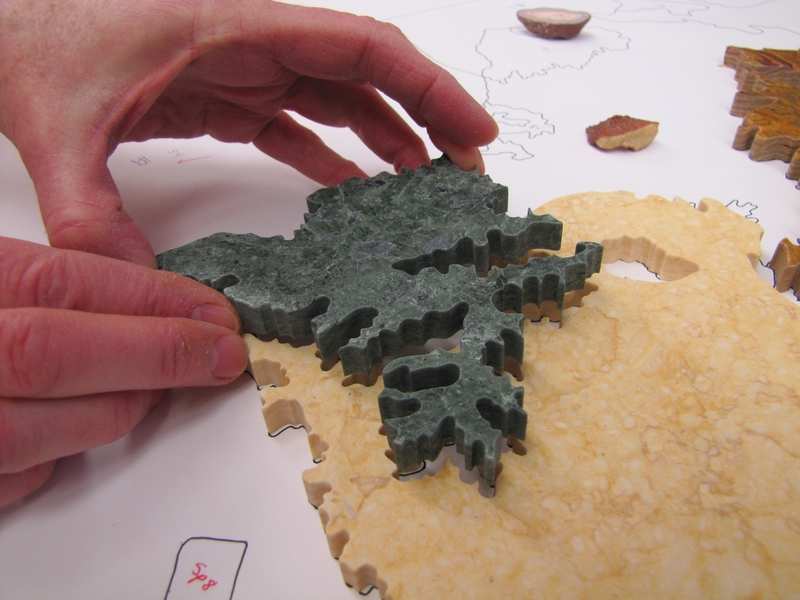 After selecting the specific rocks and specimens to be used for the design, each piece is cut to fit the pattern. If necessary, the stone is polished and sanded. The cut pieces are then adhered to a substrate and sometimes grouted to achievethe desired effect. I combine rare crystals such as amazonite from Ethiopia and apophylite from India with lapidary slabs of rhodonite, cuprite, and fossilized coral, with granite and marble. Both humble and rarified stones appeal to me because of their variety of colors and textures.